*However do note that the ♥ will not appear on I.E. So just delete the numbers if you want. Else, it will work fine. whenever i put the code it says(Your template could not be parsed as it is not well-formed. Please make sure all XML elements are closed properly. I love it...can you do it for a myspace layout? Do you think I can have pics of my bf and I? wow!! 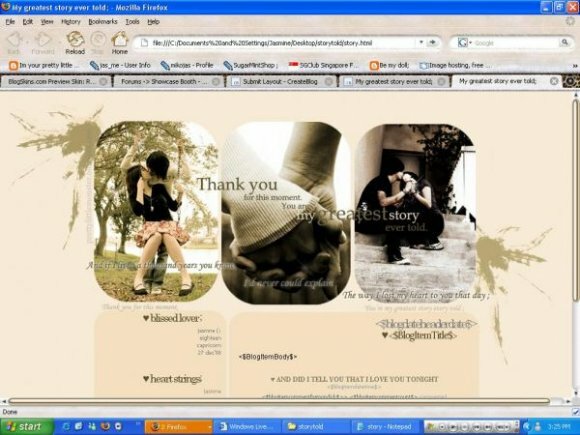 is nice..i got a problem when i try to use.. is this layout for blogspot??? This is AWESOME! :D I love it~ I don't use blogger though, I just stumbled on this and think it's great.. you should make a myspace blog version of it! I LOV THIS LAYOUT I HAVE A QUESTION CAN U MAKE IT AS A MYSPACE LAYOUT?